INTERNET FOR INVESTIGATORS HAS CHANGED! THIS MANUAL GETS AND KEEPS YOU UP-TO-DATE! Comes To Online Searching And The Internet! HOW TO INVESTIGATE BY COMPUTER 2005! WITH THESE ADVANCED TECHNIQUES, TOOLS AND SOURCES! This chapter gives you a kind of historical overview and prospective of how we got to the state of online searching and the Internet as it is today. It's important from the standpoint of knowing and understanding how the technology and sources we use today came about. You'll gain a vast insight into the technology and sources you use today and understand what these sources and this technology will do and not do for you. There are both advantages and disadvantages to a great deal of this kind of stuff and it's important for you to understand not only the advantages of using them, you need to also know the downside to all this high technology. This will give you an instant prospective in your own mind on using high technology, online searching and the internet. With that master prospective, you will learn to move back and forth from high technology techniques to low technology methology to get the very best results for your investigations. This section gives you a fast track to quickly and easily understanding all the computer and internet technology you need to know about. 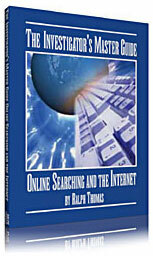 A lot of this stuff appears on it's surface to be complicated and hard to understand but Thomas cuts through all the technological baloney so you get a crystal clear understanding of how the Internet and the latest computer technology works so you can use it more effectively. This highly valuable section gives you a mega-leap on knowledge and know-how in using the different search engines and how to conduct advanced searching. Some search engines have specialized and advanced search pages that are hard to find and not generally known to the public. But once you know about them and what they do, it's a snap to use them. There are advanced searching techniques you can employ on the major search engines you can use to vastly improve your search results and this section covers these advanced techniques. There are really thousands of search engines but really only a few dozen worth using. You need to know which ones to use for what and this chapter lays it all on the line. You will avoid what Thomas calls fatal default mantality which results when you don't know the advantages and disadvantages of different search tools but rely only on the selfish default tools that your computer software or web browser wants you to use. There is a vast amount of free public records on the federal, state, county and city level but you basically have to know how to access these sources. Otherwise, you will end up paying for these searches from a commercial provider. This section shows you what there is and where to go to access tens of thousands of these free public records sources. You will find free access for stuff like real property records, corporate records, uniform commercial codes, birth, death, divorce records, criminal records and much more. But you have to understand how to use this stuff. Otherwise, you enter a mindset of what is called the "free Search" mantality and just set there and run dozens of free searches becuase they are free not really accomplising much. Understanding and accessing credit bureau reports and header reports has become a very vital part of your investigative business and this section teaches you how to use, access and analyze different kinds of credit bureau reports. There are a ton of fee based information services out there. We all need one or two. Some of them are what are called piggyback sources. That is, they gain access to another non-direct source and resale you your information. You want direct access to the prime sources and there are only a handful of them. This section takes you by the hand and talks about fee based investigative information service providers, who are the real ones and how to pick one that is right for you.You also gain insight into the all sources mantality and the cheapest source mantality because you don't need access to every information service out there. More than that, you will learn that just because one source has the cheapest search does not mean it's the best source to use. This section reveals all the telephone directory information services and gives you an in depth directory of the ones to use so you can run reverse searches, cell phone searches and a great deal of other searches you will use every day. This chapter hands you the knowledge and tools you need to know about to find anyone's email address. If someone is on the internet and has an email address, this section will show you how to quickly find it. Tracing and tracking an email has become a major service to offer for private investigators. This section gives you the know-how on how to pull the header information from any email-and track it back to where it came from. Aside from the knowledge- techniques and know-how, there are a host of tools you can use online for free to help trace emails and the last part of this section covers all these tools. This Internet Tracking section gives you the knowledge and tools to use so you can find hidden information on the internet. There are various and volumous online directories you can plug into that give you a vast amount of background data on people, places and just about everything else. This section hands you a huge assortment of tools you will use every day that is directory information in nature and scope but can be of extreme value. This chapter exposes how un-private email really is and hands you the tools and techniques needed to make email secure. You learn how to use encryption in your private email messages. You are also given a number of tools and services you can use that make your emails self destruct after they have been opened. News sources on anything on anyone have become vast. In a matter of minutes you can have a massive collection of current and past news stories on anyone or anything. You can also set certain services up that will track thousands of news sources for you and send you emails on any person or subject containing the last news. Tracking and monitoring the activity on any computer has become a major part of many private investigative practices. This chapter gives you the know-how and the tools to offer such services. And $55.00 Over Regular Individual Pricing!